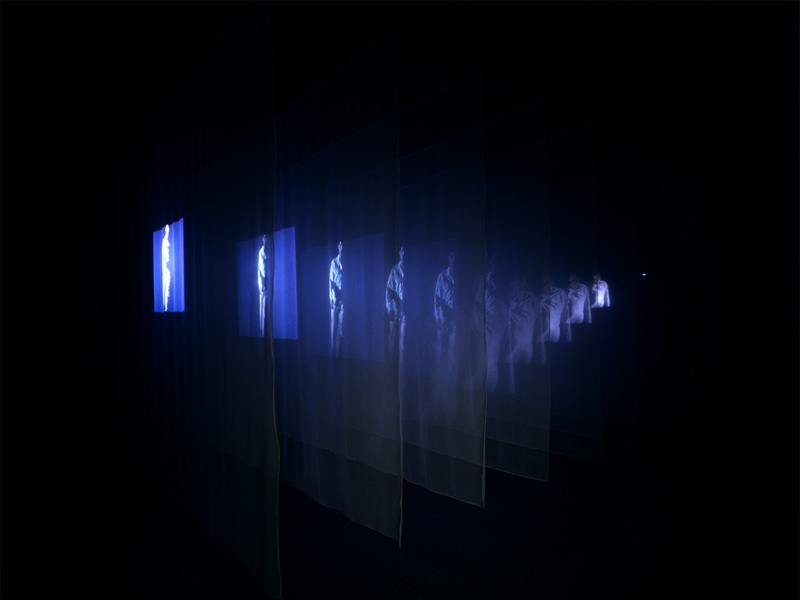 Data gathering from inside Bill Viola's video installation. 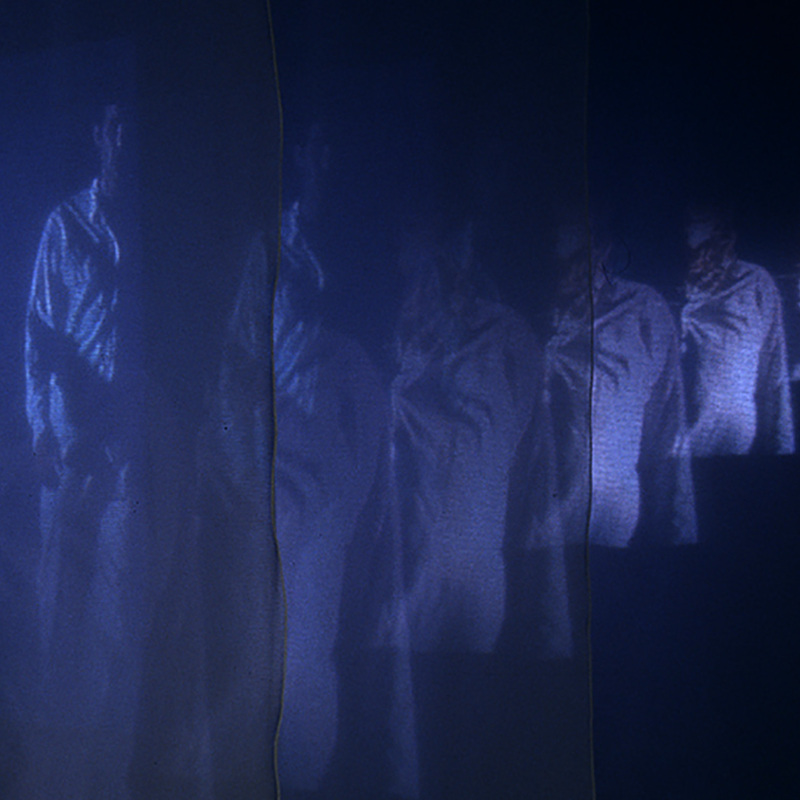 In a dark space, an unfocussed film of a man is projected through 10 translucent sheets of fabric, growing paler and larger towards the centre—the point of focus. Illuminated in another dark space, elsewhere, he walks towards us. From the other side of the room, a second projector shows the same man, but now he is walking away from us. We are outside, detached observers. We are here and he is there, moving to-and-fro. It does not change. I wonder. The panels are 400mm apart. Irresistible curiosity moves me sideways, quickly and carefully into the centre of the work. Breaking the rules, lightly touching the sheets of fabric I know, before I even see, that everything has now changed. The man walks towards me, passes through and, as I turn, he is gone into the darkness. I understand now: one movement, not two. The hairs stand up on my neck. We are both inside now, simultaneously here and there. Many years later, I find out the second man, was actually a woman. Thin parallel layers of translucent cloth hang loosely across the center of a dark room. Two projectors at opposite ends of the space face each other and project images into the layers of material. The images show a man and a woman as they approach and move away from the camera, viewed in various nocturnal landscapes. They each appear on separate opposing video channels, and are seen gradually moving from dark areas of shadow into areas of bright light. The cloth material diffuses the light and the images dissipate in intensity and focus as they penetrate further into the scrim layers, eventually intersecting each other as gossamer presences on the central veil. Recorded independently, the images of the man and the woman never coexist in the same video frame. It is only the light from their images that intermingles in the fabric of the hanging veils. The cone of light emerging from each projector is articulated in space by the layers of material, revealing its presence as a three-dimensional form that moves through and fills the empty space of the room with its translucent mass. "From the close-up to the glance, from the caress to the accidental brush, criticism can draw on spaces as they are remembered, dreamed, and imagined, as well as observed, in order to take into account the critic’s position in relation to a work and challenge criticism as a form of knowledge with a singular and static point of view located in the here and now." The term Site Writing was invented by critic and architect Jane Rendell, to discuss how postmodern feminism has explored new ways of knowing in spatial terms, developing conceptual and critical tools such as “situated knowledges”3 and “standpoint theory”4, weaving fact and fiction to examine the interrelations between location, identity and knowledge. She promotes site-writing as a legitimate form of data gathering--one that reveals the nature of the uncanny in any experience. For her this is not necessarily a property contained within an object or place, but is rather “an aesthetic condition produced at the threshold of interchange between subject and object or place, experienced as a palpable presence of the strange within the familiar". Rather than write about the work, Rendell is interested in how the critic or researcher constructs his or her writing in relation to and in dialogue with the work. Rendell argues that critical voices can be objective and subjective, distant and intimate. The question is: what role does the work play in such a dialogue and, ultimately, what role does the designer play in creating the scaffold for dialogue to occur? Are these relationships unique to each individual, or do common patterns emerge? From a research perspective, site writing reveals data that is otherwise unobtainable. The facts of the experience outweigh the facts of the event. The sociologist John Law employs similar methods that do not stop at depicting realities, instead, he argues, data gatherers should “participate in the enactment of those realities...by combining ‘in-here’ with ‘out-there’".5 Site writing is a unique way of gathering data that gives form to the subjective experience but also, being both vague and specific, brings into focus the implied absence of any given context. According to Law, the researcher must be involved in the manifestation of relations: “the enactment of presence, manifest absence and absence as otherness.” Law's work is highly recommended if you are interested in mixed data gathering for complex social conditions in the field. By gathering these writings, EBD will investigate the potential for shared experiences, while identifying that which is also unique and potentially unpredictable. Standpoint Theory concerns a personal form of knowledge that is shaped by an individual's perspective in social circumstances.